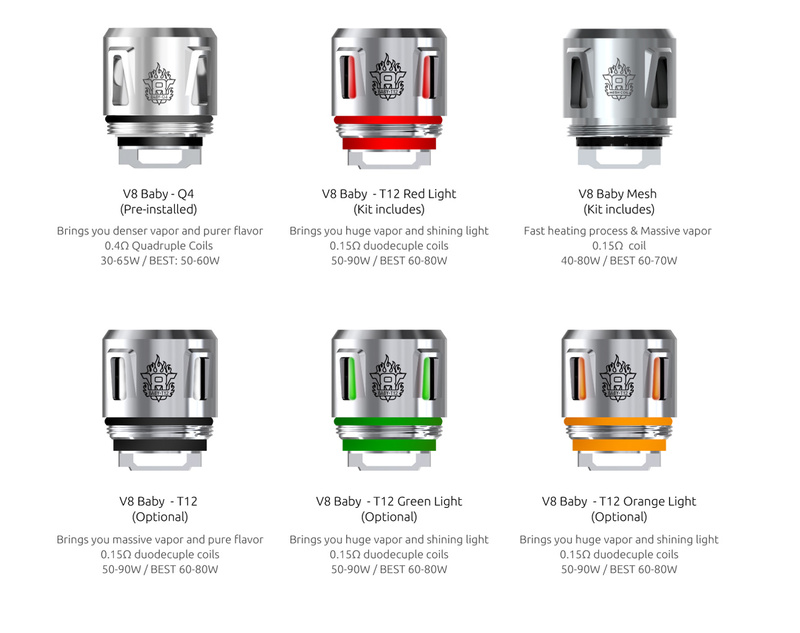 The TFV12 Baby Prince tank is the latest creation by Smok and upgraded version of the original TFV8 Baby Beast based upon the TFV12 Prince's royal aesthetics and design. The TFV12 Baby Prince utilizes new and improved TFV8 Baby Beast atomizer heads for improved flavour and vapour production using the same or similar wattage. The TFV12 Baby Prince has a unique crown-style design that features a bulb shaped glass tube. It also features a new rotary top fill design with a locking mechanism that is easily unlocked with a press of a button for quick and simple access. The TFV12 Baby Prince is topped off with a majestic wide bore Cobra resin drip tip that is sure to stand out. No two resin products will ever have the same design and look due to the unique manufacturing process.